Hi, just wanted to drop a note and idea for you. This recipe is also an old one in my family and have never seen it other than at family gatherings - so I couldn't help but have to write that these are awesome! Short story for you and idea - last thanksgiving I was stuck in the city and had dinner with a few guy friends from work. It was a very much a dude day as we deep fried that turkey outside. 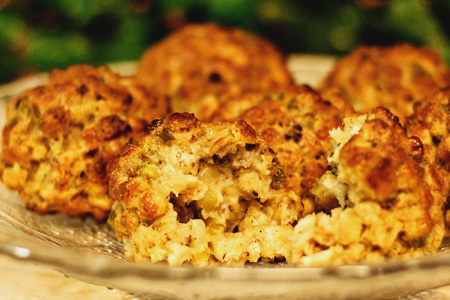 I made these and decided to put a simple batter on them and we tossed the balls in after the turkey, I mean why not? Let me just say, if you like fried foods - these were abdurd - so good. I also took way too much time to do the same things with mac&cheese but that's a whole different story. Love the blog, am a bbq beginner, and will be making your compound butter this weekend. I've made these today for Christmas Day. Of course I had to sample one, and I must say that I'm not disappointed. Very moist inside and crispy outside. If these reheat well, then this is definitely a keeper ! They will reheat fine, just heat them slowly uncovered in a low oven. Or, heat them at 350* covered with foil for about 15 minutes, then uncover them and cook another 10 minutes or so to re-crisp the outside.